Private guided tour to the ruins in Segesta and Trapani's salt pans. 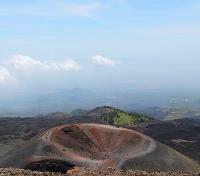 Explore Mount Etna with private guide, and delight in a Sicilian winery tour. 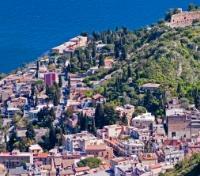 Discover Taormina, famous for its Greek-Roman amphitheater. 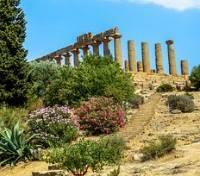 Tour the Valley of the Temples in Agrigento with private guide. 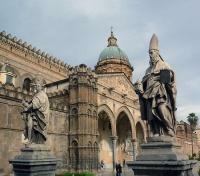 Discover the real Sicily through its glorious architecture, fairly-tale villages and sumptuous authentic cuisine. The island’s most memorable sights come to life on this enchanting journey through Italian paradise. From the lava-filled volcano of Mount Etna to the charismatic street markets of Palermo, Sicily often feels a world away from the rest of Europe. Only here can you commune with the culture of Hellenic antiquity, behold the grandeur of the Middle Ages and marvel at the wonders of the Renaissance, all forged by a dozen civilizations. Sicily has more impressive monuments than most countries have, and visiting this storied island is like visiting over a dozen nations in one. Stroll endless stretches of beautiful beaches and journey through the past as you explore wondrous Greek ruins. Watch the Trapani salt pans change color as the sun sinks below the horizon, and visit chic resort towns spectacularly perched on the mountainside. Life is good in Sicily – come see it for yourself. 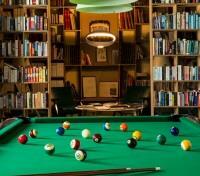 Explore Palermo at your leisure. Palermo is full of worthy sites and monuments, and in the historic district it can seem as though they are all competing for your attention. Of all the things to see in Palermo, few showcase as completely the differing influences that have swept through the city as the 12th century Palermo Cathedral, which houses a pantheon of royal tombs. Restored and shining, the Teatro Massimo, the largest theater in Italy, is also one of the premier Palermo sights. Blending flea market, kasbah, souk, and haggler’s heaven, the markets in Palermo vibrate with energy. The street foods are one attraction, and the goods quite another. See them at the Vucciria, Borgo Vecchio, Capo, Ballaro, or Piazza Perani. The museum and gallery of Islamic art, Zisa, was built in the 12th century, and was the hunting lodge of the Norman Kings. 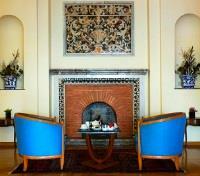 The interior highlights the architectural influences of the Moorish tribes who had only recently been conquered. One of the most memorable Palermo sights is underground, where more than 8,000 corpses have been mummified and put on display in the Catacombs of the Capuchins, a monastic order whose ossuary is under the Santa Maria della Concezione. 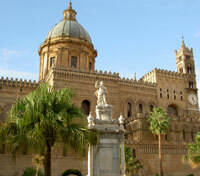 Whatever your interest, Palermo has much to offer. Meet your private driver for a transfer to Agrigento today. 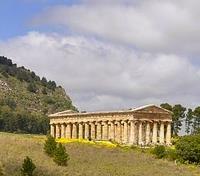 En route, you'll make a number of stops, beginning with the historic city of Segesta, where a private guide will meet you and lead you on a visit of the Greek Theater and Doric Temple ruins. The stone-built theater dating back to the 3rd century BC is rewarded with a location on the summit of Monte Barbaro, offering a stunning view out over rural green pastures and adjacent mountains. Discover the 5th century BC Temple of Segesta, considered one of the best preserved in the world, which is said to have been abandoned before it was ever completed. Afterward, head to Erice, a wonderful and mysterious medieval town made famous in ancient times as the supposed birthplace of Venus. Walk through the cobblestone streets of the town, smelling a variety of aromas emanating from the numerous pastry shops for which Erice is famous. You'll visit the ruins of the town's hilltop Norman Castle, a 12th century construct dedicated to Venus, and the 14th century Duomo, sporting a 90-foot bell tower. Make a stop at the world famous Pastry shop by Maria Grammatico to taste almond sweets, genovesi and nougat matched with Marsala wine. Leaving your guide behind, rejoin your driver and drive the historic Salt Road, with its numerous salt pans and Dutch-style windmills, concluding your day on arrival tot your hotel. Meet your private driver and vehicle as you transfer from Agrigento to Taormina today. En route, you'll get to visit the impressive 4th century Villa Romana del Casale ruins, a UNESCO World Heritage Site. Meeting up with your private local guide at Villa Romana del Casale, you'll get to discover this incredible ancient palace, most notable for its extraordinary collection of Roman mosaics, one of the most impressive in the world. Scenes include children at play, and big game hunts showing some of the exotic African animals brought to Rome for gladiatorial games. 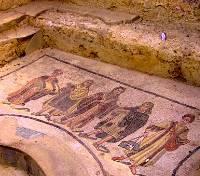 Afterward, head to the hilltop town of Enna, accompanied by your local guide. This town offers plenty of ancient Greek and cultural attractions. Among the most dominant structures in Enna, the 14th century baroque Cathedral takes a central position, featuring elaborate architectural and artistic adornments which were carried out at different times over the centuries. Continue to Taormina where you'll end your day. Grand Hotel Miramare Taormina is located a quarter of a mile from the town center and just a short walk away from the funicular and the Greek theater. 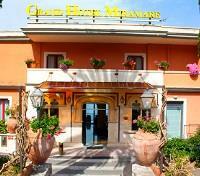 The hotel is set within an exclusive park and offers breathtaking views of the Messina Straight and Calabria. The antique charm of a residence out of another era has been maintained both within the style of the villa and the furnishing of the rooms, while at the same time adding all the comforts required for an elegant and relaxing vacation. Dine at the hotel’s restaurant, whose dining room offers panoramic views over the Messina strait, making it the ideal place to enjoy delicious Sicilian cuisine. Guests will find themselves in a pure state of relaxation in this Italian oasis. 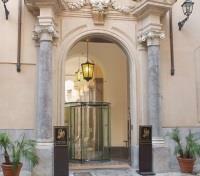 Depart your hotel on foot alongside your private guide, embarking on a half-day walking tour of the historic city center of Taormina. Stroll through elegant squares and narrow alleyways, admiring quaint cafes, stunning fountains, and spotting the 13th century Duomo, a lovely stone-built cathedral. Catch views of sites like the 2,000-year-old Roman Odeon, a place for small and intimate performances for the Roman elite, and the 10th century Corvaja Palace, detailed with Arabic influence. 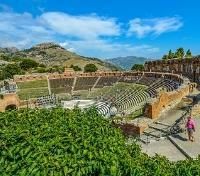 Most impressive of all, you'll visit the ruins of the 3rd century BC Teatro Antico, an ancient Greco-Roman amphitheater for which Taormina is famous. The structure still retains large portions of the original walls behind stage area, very rarely preserved so wonderfully in ancient amphitheater remains such as these. Conclude your tour back at your hotel. Meet your private driver-guide this morning, setting out to explore Mount Etna, the largest active volcano in Europe, where you can admire a unique combination of nature with the uncontrollable essence of fire. Your guided walk options of Etna will vary depending on weather and safety conditions, and may include an exploration to the Silvestri Craters at the Sapienza chalet, as well as some of the quaint and beautiful towns on the volcano. Enjoy gorgeous sweeping views, including those over the coast of Eastern Sicily. If you wish, you can even choose to ascend Etna by cable-car for a view of the 2001-02 crater (weather dependent, payable on the spot). 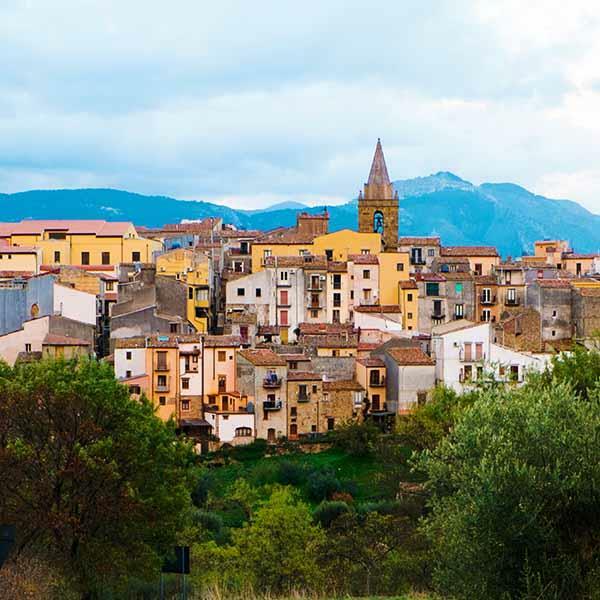 Afterward, you'll visit the Barone di Villagrande, a small and elegant wine resort nestled among forests and historic vineyards, home to international wine tourists looking to discover the proverbial hospitality and cuisine of Sicily. 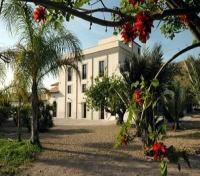 A delightful Sicilian lunch will be provided for you in the winery before returning to Taormina in the afternoon. Meet your private driver and vehicle for a transfer to Catania Airport. Approximate travel time is 45 minutes.